MAN Diesel & Turbo has secured a contract for the delivery of three MOPICO® motor pipeline compressors to a German remote line network operator bayernets GmbH and comprehensive maintenance services. The compressor station will be built in the Prettelshofen district of Wertingen, Germany, to increase gas transport capacities and satisfy the growing demand for natural gas. MAN compressors will be installed in the plant. To allow large volumes of gas to be transported across longer distances, compressors need to increase the pressure in the pipeline every 150 – 250 km. The three MOPICO machines will compress the natural gas to around 80 bar. bayernets began construction of the compressor station in September 2017 and the station will be put into operation in 2019. The machines will be delivered from summer 2018, onwards. In addition to their delivery, installation and commissioning, the contract also covers maintenance services for the next 20 years. Environmental aspects played an important role in the decision on the technical equipment of the plant, as it is being built in the immediate vicinity of Wertingen. "As our MOPICO systems are hermetically-sealed and equipped with magnetic bearings, they require little space and can be operated emission-free without using oil. 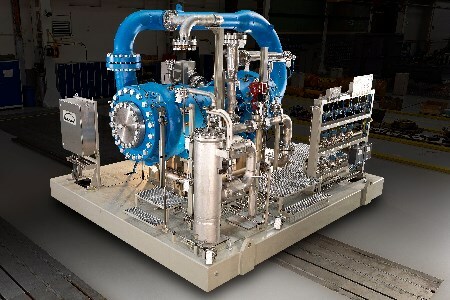 This technology meets present-day requirements on the construction of European natural gas compressor stations – requirements which are becoming increasingly established as the standard," explains Matthias Grapow, Vice President, Sales & Contracts Oil & Gas Midstream at MAN Diesel & Turbo. "The high efficiency, operational flexibility and low-maintenance nature of our machines are further benefits that we are able to provide to our customers."